Every bill introduced into Congress has to go through a period of revisions before the final vote is taken. The Social Security Act of 1935 was no different: the bill's drafters took into account the president's wishes, the recommendations of the Committee on Economic Security, and the advice of various groups lobbying for the bill's passage, including the NCCC. The documents included on this page demonstrate the involvement of Catholic Charities in the drafting and revising of the Social Security bill. 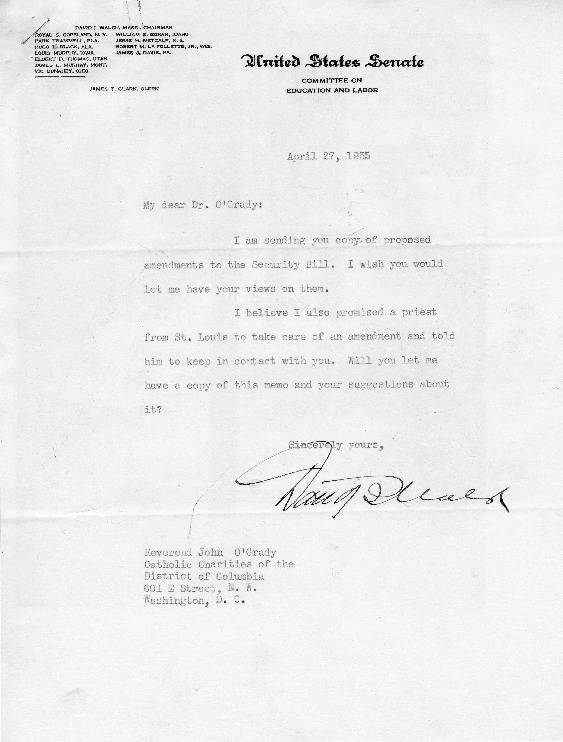 In the first document, David Walsh,an Irish-Catholic Senator from Massachusetts, writes to NCCC General Secretary John O'Grady and asks O'Grady's views on some proposed amendments to the bill. The second document contains O'Grady's response to Walsh, as well as the official changes proposed by the NCCC. Reading these documents together helps illuminate the role that O'Grady and the NCCC played in the drafting and passage of the Social Security legislation. They offer a detailed look at the Catholic perspective on social legislation, as well as exceptional insight into the law-making process. How do Walsh's proposed amendments compare to the changes proposed by the NCCC in the previous document? first document? Why do you think Walsh requested O'Grady's input? Compare the changes by Walsh and by the NCCC. What changes were made? Why do you think that these changes were important to the NCCC?